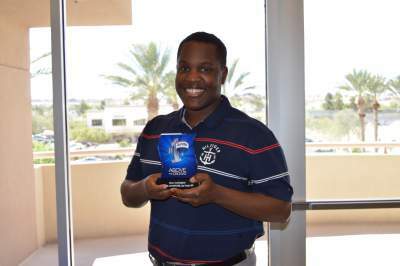 LAS VEGAS - March 30, 2016 - PRLog -- Shawn Cunningham with Cunningham Group at RE/MAX Advantage was recently presented with the RE/MAX "Above the Crowd" award during the RE/MAX office awards presentation. The award is only presented to one REALTOR per region. The southwest region is made up of Arizona, New Mexico, and Nevada. The "Above the Crowd" award is annually given to one REALTOR who is one of the top earning in commissioned sales and is recognized for their 'above the crowd' hard work in the community throughout the year. "I am honored to be recognized with the Above the Crowd award from RE/MAX Southwest. I am very privileged to work with everyone at our company because you are the rarefied best, not just in sales but also in community involvement. Many in our company constantly amaze me with their capacity for generosity and giving, even if it may go unnoticed, or not win awards. My goal isn't to win awards, but hopefully inspire as many as possible to recognize the unique power you have to make a difference, not just as small business owners, but as elite members of the real estate community." Joan Kuptz, RE/MAX Advantage owner, nominated Shawn for his work with many charity organizations in the community, for his top performance as a REALTOR, and as a team player. He is dedicated to helping youth and bridging the opportunity gap. Shawn takes part in the Big Brothers, Big Sisters program and has volunteered with Childhaven, Spread the Word, Shade Tree, UNLV DECA, and Nevada Partnership for Homeless Youth, to name a few. He has also organized a Junior Achievement event with 40 local REALTORS to teach financial literacy for a day to under-performing elementary schools. In addition, a portion of every sale is donated to a local charity in the name of the client. Shawn has more than 16 years of experience in real estate and is currently the chair of Nevada Certified Residential Specialists (CRS) in Las Vegas. He is the vice chair of Forms Committee at Greater Las Vegas Association of REALTORS (GLVAR) and a graduate of the Nevada Association of Realtors Leadership program. In addition, he runs a real estate office with a seven person staff. Shawn also received the RE/MAX Chairman's award and is ranked 9th in the state of Nevada as a top producing team leader for 2015. "Shawn is a driven, successful entrepreneur who has for years been committed to helping the community through financial donations, but more importantly time," said Tim Kuptz, RE/MAX Advantage owner. "He is a true leader and has inspired many in our company to be more community focused." Cunningham Group at RE/MAX Advantage, located in Las Vegas, Nevada, is a real estate team serving the Las Vegas, Henderson, and North Las Vegas areas. It was founded in 2010 by Shawn and Kyle Cunningham. They have developed a small team focused on maximizing client relationships by providing the value the client seeks. Cunningham Group at RE/MAX Advantage focuses on traditional buyers and sellers, along with investors and property management clients. For more information about Shawn Cunningham and Cunningham Group at RE/MAX Advantage please contact Heather Robinette at (702) 823-0838 or by email at heather@cgvegas.com You can also visit their website http://www.cgvegas.com.